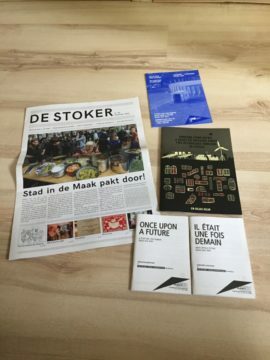 As a Director of The Generator Loughborough CIC I'm taking part in an exchange programme with another hub in Rotterdam called City in the Making (Stad in de Maak). This is my blog about my week long immersion in this amazing undertaking to create a different kind of city. My favourite concept in the City of the Making was Christine and Sebastian’s house where they are breaking it down and re-building literally inside and out whilst they are living and working in it. 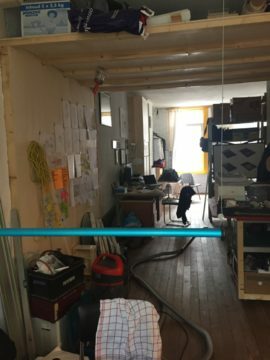 Because of the SidM desire that there is always a ‘common space’ they are giving up their home once or twice every year to artists in residence on a time-share basis. I was awed by their willingness to try all this out, changing radical things, in a small amount of time in the space they call home and by their enthusiasm for this entire process. Four months ago they moved from Eindhoven where they were studying and moved their family (one small daughter and a new baby) to this house that had previously been occupied by students. They bring with them a network of artists and experimenters that are attractive to the project. Christine van Meegen graduated in 2015 with a Master in Social Design from the Design Academy Eindhoven and started Studio C.A.R.E together with her partner Sebastian. They call it an ‘urban research laboratory’ where they are living and working under constant conditions of change. The studio focuses on using methods of arts, architecture and design to deconstruct spaces and realities, aiming at reconnecting inhabitants and users through unconventional methods with their environment. Christine is also a co-founder of the Umbrella network a collaborative network of designers, creative collectives and curators who value social processes within their creative and curatorial work. She talked about their project Agents of Change in collaboration with the Van Abbemuseum. It is a starting point for a negotiation process with the art institution to re-think its position within the city and open up different possibilities of support and interaction with these communities. 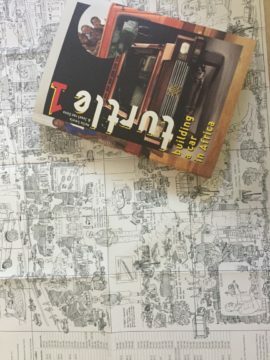 The project connects local initiatives, individuals and active communities by organising interactive tours, workshops and various activities to create a social map of the city. 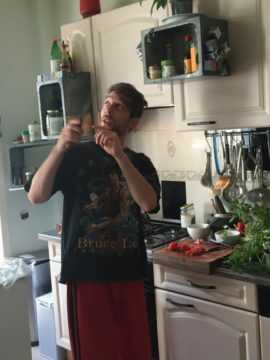 As I wandered up and down the house admiring the evidence of this kind of change-making where walls and doors had been trimmed or taken out, Sebastian was preparing lunch. The blender broke so I cranked up my pestle and mortar skills to work on the pesto for the delicious seitan burgers. It tasted all the better from working on it collectively! This experiment they tell me is inspired by the work of Buckminster Fuller who experimented with failure . Their experiment is not only redesigning but also bringing in others to learn and extend their own knowledge in the experiment. They have lots of different ideas including a local cookbook and even putting a lift in that moves through the centre of the house. They have 5 years in which to do all this. But they are not put off by the transcient nature of the project, in fact it is the temporality that attracts them – in order to show what is possible in a short time. They talk about one of their project goals being able to have a foldable flat that you could get ready and move with in the space of one day. Just as in the past we might have moved from cave to cave in a day. Neither Christine or Sebastian are from Rotterdam, actually neither are Dutch they are both German but they have been attracted to Rotterdam in the same way as I am, there is a rawness here and attitude of anything is possible, you can make a living AND be an artist. I hope they do it! My final visit of this research trip was to the property on Blockenstraat to meet Gaia who is a Fine Art student of the Willem de Kooning Academy. This beautiful place is home to five people over three floors with their ‘common space’ on the ground floor. Luc also shares this space and he has been there for the two years since SidM took on the property. He graduated last year and now works as an intern with Guido. Quite a few students have moved through the property coming and going, including a couple of Syrian refugees but Gaia tells me it is a complicated situation with them as there is support they can apply for but it means they can’t stay at their place for very long. The steady turnover of people has meant that they have found it difficult to make things happen at the property. Gaia also tells me they may have to move out in 18 months as the property owners want to sell and so this prospect is also hanging over them. The common space has had several guises and recently the artist Maria Blinkhoff took over the space holding an exhibition in it. The magical charcoal dust wave mural that greets you when you enter the space is one of her legacies. Gaia says she wanted to return perhaps using the space for spoken word nights but they have not heard from her in a while. It seems a theme of the house is things beginning and not quite getting going. 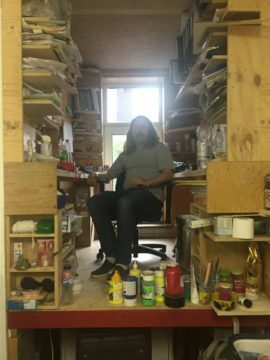 Of course living and working in the space there are also issues around storage and not being able to separate work and life. In the common space itself is also the community washing machine. 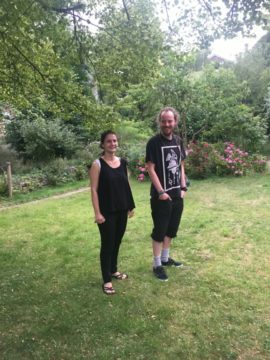 Just before I headed out Gaia and Luc showed me round the beautiful community garden at the back of the property which is a lovely wild tranquil space and breathes a beautiful sigh over the properties that look out into it. As I walked round I imagined it filled with art and the potential for a lively community event radiates from it. I wonder if it could be an opportunity to showcase some of the work I had seen that is being produced through SidM – but Luc tells me the relationship with the people managing the garden is also complicated. So again, an idea that is pulsing but still waiting to happen. Fingers crossed the wait is nearly over. 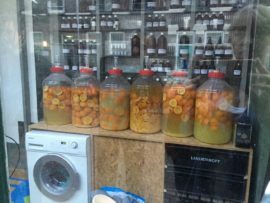 On Wednesday I headed back over to Pieter De Raadtstraat to meet Guido inventor of the strange concoction of oranges in huge glass jars in the Stokerij window placed next to a washing machine. Guido lives and works at the top of the Pieter De Raadtstaat above the SidM offices. His floor mirrors that of the office but is one long room without any dividers and a bathroom instead of a kitchen. 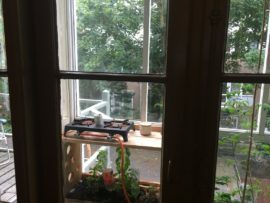 Guido has constructed the kitchen in his live work space next to the balcony where he is growing salad, herbs and a wild triffid-like tomato plant (the plants look very happy indeed!) There are some strange leaves in a bucket I don’t recognise but he tells me they are pumpkin and he just threw the seeds in to see what would happen. When I’ve grown pumpkin at home they need lots of space but here they seem to be growing ok, just small. Plants feature largely in Guido’s living and working, he has several ‘rescue’ plants and the flat feels airy and healthy with them all thriving. The bed is in the middle along with wardrobes against the wall but somehow this works with the office at the end. 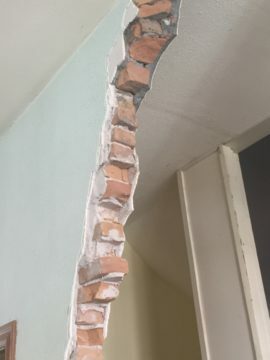 There are different features Guido has kept from the original building – a door in the wall that has been uncovered with different layers of wallpaper alongside it and the old gas fire. Dutch city houses no longer run on gas so essentially this is now a museum piece. Guido begins by telling me about his work with Stad in de Maak. His invention, the laundry soap is really only just the surface. There is a nice synergy about having the downstairs as a laundry because in the not so distant past (19th Century) the building was a water distillery which serviced the entire street for hot water. He says that in addition to water you need soap to wash so now this is what he provides, plus one washing machine for people in the street to use if they wish. The brand name is Van Blanckensteyn (a soap entrepreneur from a past century) and one of his inspirations is the book Blue Economy by Gunter Pauli that looks at the five kingdoms of nature: animals, plants, fungi, algae and bacteria and how we humans can work better with all of these . It was here in this book that they found the idea of using orange peel to create soap . 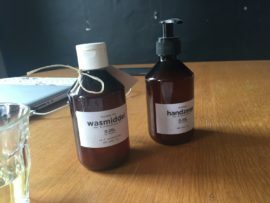 Guido and his business partner Alex took the idea to the Department of Search (you can read about this in the previous blog) to try and work out the best process using fermentation (one of the oldest processes that uses bacteria) . At the Dept of Search people can bring their questions and are given some funding from the municipality to help them. Guido and Alex were of the first 12 artists that were funded by the Department. Now they have lots of people interested in their product including big companies such as the Facilities Service Centre of the city. The recently won a prize that has meant they have had business support such as workshops and mentors to help them with their brand. It was through this they realized their brand was not really the product itself but the mechanism and processes they invented in order to create their product. Their dream is that they can provide efficient machines so that all over the county (possibly the world!) where there are waste oranges people can utilise them to make useful products and therefore the energy is put back into the cycle. Of course, it doesn’t just stop at oranges – Guido is experimenting on lots of other plant products too. It is about looking at waste and utilising it so the energy goes back into something useful. So far this business venture isn’t making any money, in fact, Guido says it is still costing money so he has a design business that he runs too, and a pretty successful one too. He creates furniture and is interested in public furniture that is temporary and that provokes interaction, helping people feel ‘comfortable’ inhabiting it ( I asked if he had seen the Playable City project as I thought it would be something of interest ). He says Rotterdam is changing as old industry disappears so the spaces are changing too. He is creating simple designs so that the process of making furniture is as quick as the design process . He has combined these two things with another of his ideas which I can see working as a pop up across the city and at festivals everywhere and that is his Zero Waste Juice bar. He is of the belief (which I am hearing a lot this week) that: Knowledge comes from the practical . The ethos is about people being able to do things for themselves. Back to the washing liquid again, he is not really interested in ‘selling’ his product (he describe s it simply as a method of communication) but in empowering people to deal with their waste better. If they first come across the product and it helps them look at the world differently then great and as we all know you need a good story to engage people in the first place but for them it is the process that is key. Guido is a busy person, as well as two businesses he is a daddy and he is teaching his son about his processes early. 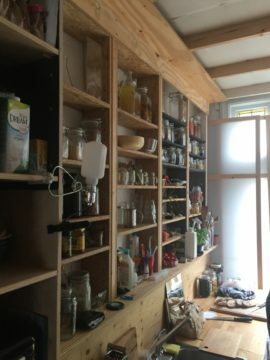 All over the flat are different jars, pots and plastic tubs of fermenting fruit and vegetables and already his son asks where everything that is being used comes from. We talked about Stad in de Maak as he has been involved with the concept from the beginning. He says that there is more work than the directors can cope with right now. It is the impression I also get as they flit around from job to job and space to space all week getting things done. There are always things that need fixing, in fact while I was there, the floor was being dug up to check the foundations (houses in Rotterdam sit on poles at keep them out of the water!) and the community is pretty much left to do their own things without any intervention and often without enough support. A few people have mentioned this including Guido. 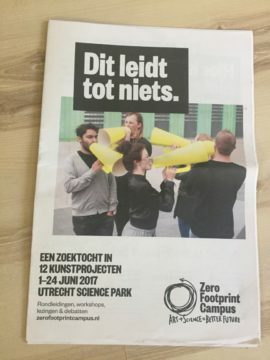 It is particularly difficult for those just graduating or still studying as they often lack the confidence that say, Melle, Daan and Guido have, to just try something out and learn while they are doing it. Someone with a role like the one I have in the UK would be a valuable resource says Guido. Perhaps this is something I can help them set up for the future? Lunch is a good time for meetings. I had been introduced to Melle Smets http://www.mellesmets.nl (he rents one the apartments in the building from SidM) at the Neverland Cinema so over lunch I chatted to him to find out more about his work. He told me about his project travelling along the highways in of The Netherlands to see if was possible to live on them. This project then became a book with his partner on the highway, Bran Esser called Snelweg Verhalen and is about to become a documentary on TV. The project also resulted in a new museum dedicated to the Dutch highways. From living in a car and making it his home for this project he then travelled to Ghana to a small town dedicated to making new cars from scrap cars called Suame Magazine. Here he lived with the local craftspeople and with them built a car. The car was designed to be the best car they could think of with multi-functions, for example a truck that also doubled-up as a market stall. Why did he do all this? Melle is interested in the study of landscape, how humans and land interact and the exchange between us. He is also interested in stories and what we can learn from them. He talked about our fascination with the ‘new’ and how this is seen as exciting but he feels we don’t ask enough about the ‘old’. 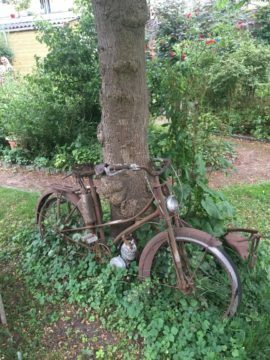 He asks, ‘What is real innovation, there are so many things that are labelled innovative but are they really – perhaps the bicycle and the condom?’ (we are in Netherlands after all). He uses the word ‘de-systemisation’ , first thinking about all our systems and strategies and then re-looking at what we don’t need and also what we can utilise from the modern to do something constructive not obstructive. 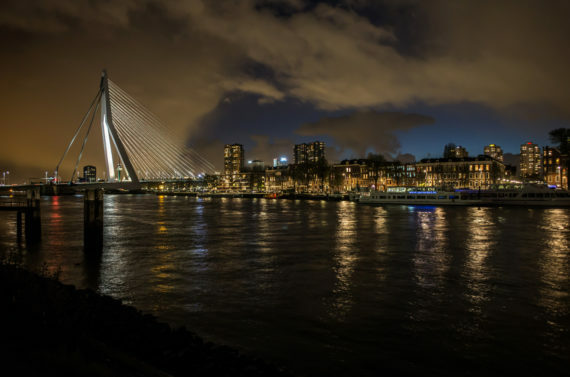 This is what led him to his current work at the university of Utrecht as he decided it was important to be where there are policy makers and where there is currently funding for innovation. His current project has been to set up a new department at Utrecht university that is called The Department of Search (just ‘Search’, not ‘Research’) that brings artists and scientists together. He is two years in and is finally getting somewhere. At the beginning, he just had to squat on the fields outside. I asked if they tried to remove him, ‘Yes of course’, he says, but because of his previous work, the media knew him and obviously began a feature on what he was doing. An irresistible story for them and probably highly irritating to the establishment, but of course it meant they needed to listen to his proposals and so now they are and he is beginning to work within the university not from the outside. They have had some investment from the municipality but not much yet from the university itself. I thought of the Institute I am involved in in the UK at the University of Leicester where they had to convince a panel to invest in research into Cultural and Media Economies http://www2.le.ac.uk/institutes/cameo In the UK we are used to doing things from the inside out not outside in. Perhaps we are worried about not being taken seriously if we try another way. Melle’s way has brought in networks of artists and thinkers including journalists who didn’t have access to the university previously. There is an event this year called the Big Campus Debate which brings the network together and it will be interesting to see what this new movement achieves. My next visit took me 5 minutes around the corner to Banierstraat 62 to the studio of artist Daan den Houter http://www.daandenhouter.com. 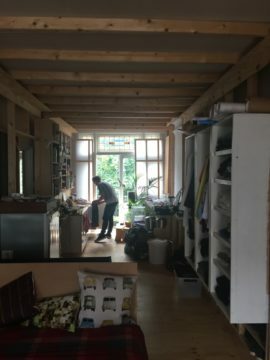 He shares the building with two other artists who have studios in it and the ground floor is their common space which is kitted out as a semi professional kitchen that people can hire out. Two years ago Daan founded the B-Cademy, a year-long post-academic course for young artists that teaches them how to survive as artists. They travel from all over the Netherlands and each month they spend a day at the space where they have visiting lecturers and can discuss how to survive including having the tools they need to run a business. 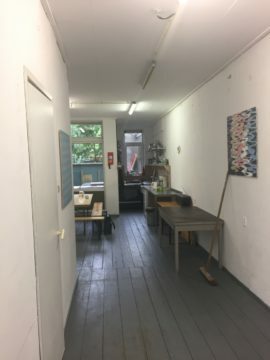 To be selected they need to bring along their artwork and be willing to donate a large piece to the B-Cademy (worth 500 Euros) and several smaller pieces (each worth 100 Euros) that are given also to visiting lecturers as payment. This first exercise teaches them about how to price their work before they have even begun the training! There is also a show where they can sell at the beginning and at the end of the year where they can sell pieces. This, as I know from my own graduate support project WebinArt (which will support 40 graduates for an 8 month programme ) is wholly absorbing work. I asked if people stayed in touch, ‘Yes, they do’, he says and it’s great to see their confidence grow as a group over the year. Last year they had a few drop outs which he said was hard to deal with as with as they invest so much in the ten that are chosen. In addition to this work, Daan received some of the Art of Impact funding from Stad in de Maak to start his kitchen. This is set up as a Foundation which seems to be the equivalent of a Social Enterprise in the UK. It is a semi-professional kitchen at the ground floor which can be hired by groups for dinners etc. There is also a garden which opens towards the small square. Anyone can hire it whether for their own parties or families or local providing a service, as long as they leave it how they found it. The income from this helps subsidise the rent for the studios and is another income strand for the artists themselves. I was fascinated by Daan’s journey as an artist and how he combines both the social side of his work and his own practice. He is always having new ideas. This is a theme with everyone I have met so far, the ideas stream out of them like an energy force. He showed me some of his new pieces where he is working with ice. The work was kept in the freezer and when it is taken out for the exhibitions it basically takes 4 hours to melt. The recent collaboration with his girlfriend, a photographer saw the ice works melting over her photographs. I loved these pieces. Dan uses vibrant colours and all his work explores a way of looking at questions you ask when your own sub-conscious reacts to the world you are looking at. Amongst his work, there were so many pieces that could be the subject of a long blog in itself e.g. the canvas that is painted over every few weeks, the metal cubes with one that holds some gold inside, but for this blog it wanted to know about Daan’s role at Stad in de Maak. He was the first ‘visual’ artist I had met who was part of the project and he juggles his time working on everything. He is a director too, though not as immersed as the others and of course what he’s interested in foremost, he says, is the art so he keeps coming back to that. City in the Making started from opening vacant buildings to the wider community and making them affordable. These buildings are crucial to the current economy, they are commodities rather than the speculative real estate that brought about the 2008 financial crisis. People need spaces from which to operate and City in the Making (SidM) is now bringing these buildings back into use. They are a mix of living, working and community space with the idea that they can become self-reliant and economically more robust. They are not just there or their own sake but for the street and for the neighbourhood and ultimately for the city. SidM have these buildings for different amounts of time, between 3 and 10 years as collateral gained from the ‘crisis’ bringing real estate out of the market and into a common resource pool. It is exciting to imagine what are they going to achieve in this time? 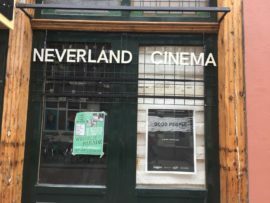 Monday evenings are Neverland Cinema nights at Pieter de Raadtstraat, one of the building sof SidM. 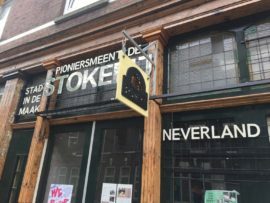 Neverland is an independent not-for-profit local cinema ‘squatting’ on the groundfloor of Stokerij (Stoker House) https://stokercinema.wordpress.com. Neverland was set up to bring people together once a week and create discussion. The movies they choose are themed monthly and these themes are topics that concern and interest the group that could spark discussion. I arrived early and bumped into Christine who I had arranged to meet on Thursday. No-one was about so we decided to cycle round the corner and go for tea. She and her husband are interior designers and she told me about her incredible past few months, moving with a 6 year old and new baby to one of the houses in City in the Making in order to deconstruct it completely … but I will tell you more later as my visit to this house will be later in the week. Back to the Neverland – Klodiana Millona is the person behind this fantastic project and on the day I visited she had just graduated with an MA in architecture. Her parents had travelled from Albania to celebrate with her and were staying in the Penthouse Flat, also part of Stad in de Maak. 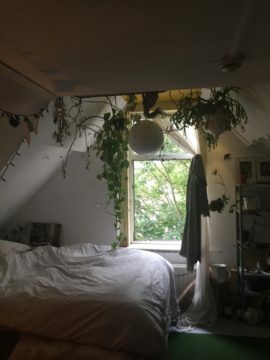 She told me she had come along to see the space on the recommendation of one of her lecturers Erik (one of the SidM directors) and was attracted by being able to live and work in the same space. She loved the empty space and together with friends (also students) who were also interested in being a part of the experiment, they tried to decide what to do in it and came up with the idea of the Cinema. They wanted to do something which stimulated conversation so they decided to put on films. Erik had already sourced a few of old cinema chairs and so they went about collecting more from the same source (sitting on these for the hour and a half film I can vouch for the chairs being incredibly comfortable!) Klodi said they had tried various arrangements the first with the screen being behind the shop front where the audience essentially look out to the street. The current arrangement is working well with the cinema being up some steps and elevated at the back of the space. The space is also being used for talks and one of their big successes was having a visiting lecturer (who loved it) come to give a talk to students. Programmed every week, Klodi says they now have a regular audience and curious new people come along too. She thinks that part of its success is because it is free. Drinks are offered at a 2 Euros for either beer or wine and when I visited there were shots of homemade rakia to follow and an Albanian spanakopita. I loved the laid-back vibe with people hanging out both inside and on the street benches before and after the film and everyone incredibly friendly and interested in what each other was doing. Around midnight people started to leave and I cycled home on a high thinking about where we might have our own cinema space in the Generator. I arrived in Rotterdam on Sunday evening and headed straight to the Airbnb in Blijdorp district, a lovely ground floor flat looking out to the park. 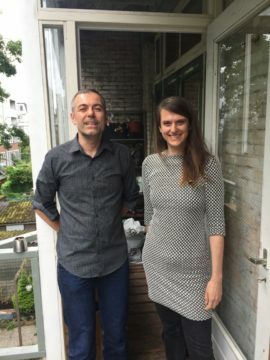 On Monday I arranged to meet Marc Neelen and Ana Džokić from Stealth Ultd http://stealth.ultd.net, two architects who are directors for Stad in de Maak (SindM) City in the Making. It was a 20 minute walk (and an even closer bike ride) from where I was staying and I got to walk along two canals on route. I love Dutch lunches, essentially more cheese than you can imagine in the UK, several varieties of bread and humus and salad all thrown in. Our ‘working lunch’ focused on getting Marc and Ana up to speed and introducing their partner Piet another director for SidM to our own project, the Generator in the UK and learning about progress on the City in the Making. As we are not in our building yet we talked about what might be some useful things to think about as we are in the planning stages. Here are some tips from Marc and Ana about the preparation stages. When taking on and planning a building first think about what the concept is. Is it just a refurbishment or are you offering more? Do you just need to guarantee Health and Safety to those who will be in it or more than that? This is the basic step and here you can think about material choices also. Second think about what the spirit of the intervention you are planning is. Are there certain words that express what you are trying to bring to your community, such as ‘raw, bare, or undressed’ space. ‘Radical choices’ are often what makes something interesting. When choosing your engineers or your architects you need someone who thinks along your lines, shares the same spirit. Can you ‘workshop’ with different architect to choose an approach you like. Next look at the ‘capacity’ of the users. Who presents a RISK and who is NO RISK. It helps to know what people can do themselves and that this also helps you decide who goes where in your space(s). To attract people who are proactive and are ‘pioneers’ there needs to be a sense that nothing is finished, so they feel part of creating the space. This can also be a financial necessity. The sense of being able to improvise and ‘anything is possible can be inviting. There are lots of people all looking for workspace so it needs to flexible. There needs to be a balance – improvised and open on the one hand and some things that have been fixed to provide a decent place to work (and in some cases live). For SidM they needed people who could fix things. What these people then get in return is space for free. There was also seed funding (grants) for people from the Cultural Foundation which contributed physically to the state of building and also helped fund certain projects.